Three new polls were published yesterday, each taken over two or more days in the past week. While their messages were mixed, the overall impact on the Irish Polling Indicator polling average is limited. Generally, Labour and Sinn Féin seem not to be doing particularly well this campaign, with Fine Gael also showing a loss of momentum. 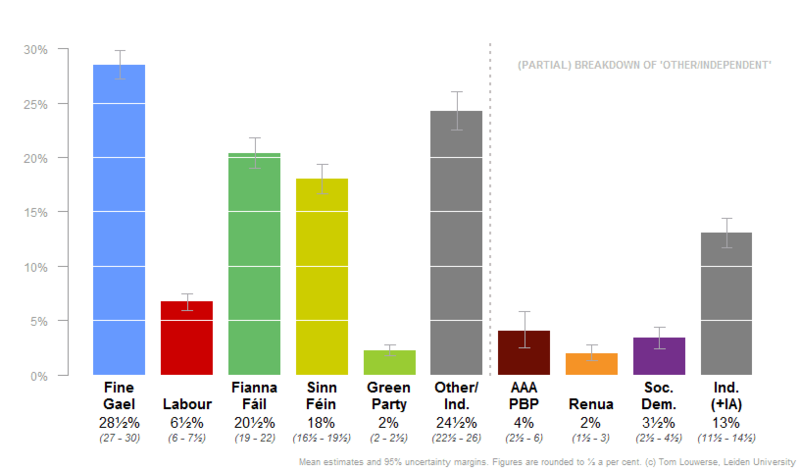 Fianna Fáil and some of the smaller parties, particularly the Green Party and Social Democrats seem to be doing relatively well. But it is important to note that most of these changes are within the relevant 95% uncertainty margin, meaning that we cannot be too sure about these patterns. We're expecting a new Ipsos MRBI poll to come out tomorrow, after which I'll publish an updated polling average here with analysis on the Irish Times website.